Returning with a collection after almost a decade, Sunita Shanker’s (SS) love for the traditional crafts still runs strong. 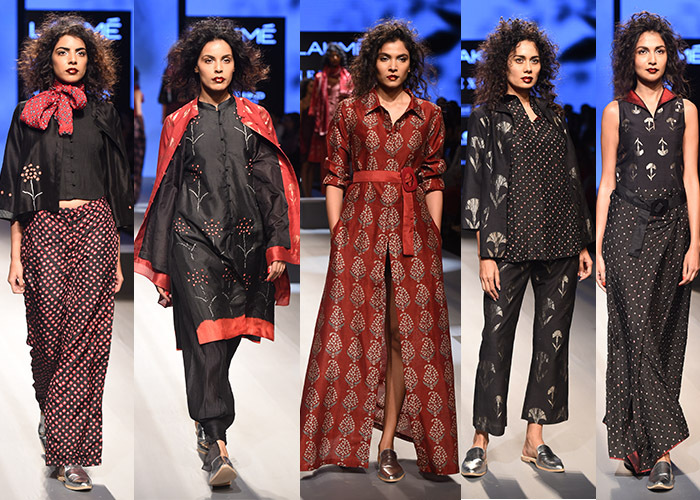 After launching her eponymous label in 1994, she began retailing her designs from many premier stores in the country, including Melange, founded by Sangita Sinh Kathiwada (SSK), in Mumbai.The store is one of the country’s earliest multi-designer offerings that was born 25 years ago. 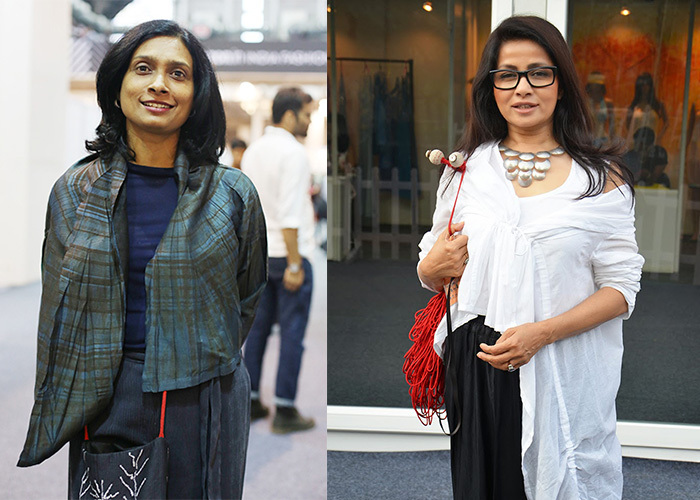 We chatted with the duo during Lakmé Fashion Week’s recently concluded Winter/Festive 2017 edition and traced their journey in the industry over the past two decades…. SS: In Kutch when they work with bandhni, they basically use black, white, red and yellow, but I’ve steered clear of yellow. The reason that I used these colours was because there were so many elements; bandhni, kantha, Benarasi, brocade and Bagh prints. I had thought that for a better visual reason, it was good to stick to a certain colour palette. With so many elements, you can go berserk if you don’t control it with colour. I also feel that this palette, handled in the right proportions, always gives you a certain amount of sophistication and sassiness. I started working in the crafts sector with the Ministry of Textiles about two decades ago. I enjoyed the first trip. When I went to Bagh, it was fantastic. It is pure organic chemistry and I did a collection for the ministry which turned out to be very good. Henceforth, I was given more opportunities to travel and work with the printed textiles that we have. That’s when I embarked on the journey of learning about textiles and crafts. When people say I’m coming back after a decade, I say the audience wasn’t ready for it then. It was more of bling, sequins and embroidery that worked back then…so people were not aware of crafts and didn’t care. It’s only recently that people have become more appreciative of these traditional techniques. SSK: I will have to contradict that statement because it was 25 years ago that we started Melange and the collection was 100 per cent craft-oriented featuring every high-end designer, whether it was Hidden Harmony, Sujit Mukherjee, Wendell Rodricks or James Ferreira…everybody was given a brief that they have to work only with crafts and skilled craftspersons and they have to use 100 per cent eco-fabric and natural dyes. We were sold out in three days. When Devdas released 15 years ago, the NRI community started buying clothes resembling the costumes used in it. At that point in time, the pattern of buying and selling in fashion changed because people started looking for what was on the celluloid. Melange had the Japanese, Italians and Germans coming to the store to buy traditional textiles. For three to four years, Bollywood suddenly took over, especially overseas. The NRI clientele came in and their consumption was so high that most designers bent towards it too. Therefore, even the Indians started emulating their buying patterns and now I’m very happy to say that they’re realising the value of the weaves again. At one point, everyone was losing touch with our Indianness, our skill and craftsmanship. Because of the dialogue on sustainability has initiated that conversation again, and it makes me really happy. SS: I think this revival of arts and crafts will last! SK: I frankly think there is nothing like revivalism. The fashion fraternity is very small, despite which craft has survived. It has thrived over centuries in India and it had never died. Who are we to claim the badge of revivalism? It is awareness that we are creating. We’ve just been working with craftspeople but it’s all originally their work. We’re bringing more interpretation, intervention and making it more available. 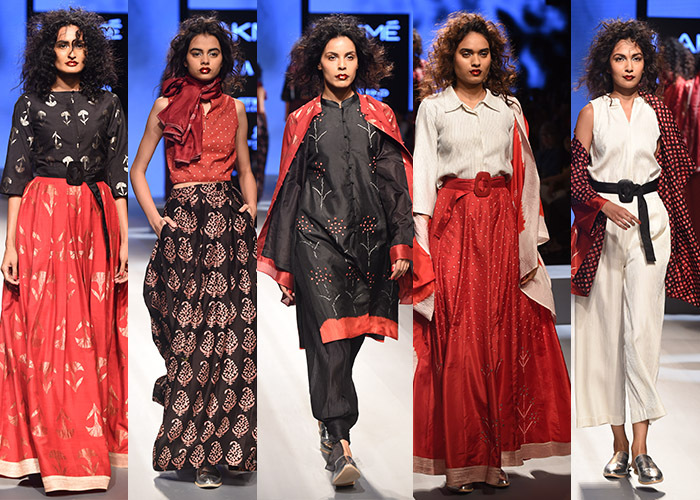 Sunita Shanker’s actually using the bandhni as an application with different placements and therefore making it more wearable for a contemporary and global woman. SS: That’s the way. That design intervention is always important but it has to be done in a context of the craft practice without losing out on its vocabulary. Now people need to do things by hand; it is far more therapeutic. And as she says, we’re ignorant about craft but it can never die. SK: And because it’s therapeutic, it’s also about community. Today, there are millions of people all over the world who are lonely because we have forgotten what it is to live in a commune. In any craft that is practised at home, from generation to generation, everybody’s roles are defined. It becomes like a community activity which today is like watching a film. There is a sense of it all coming together. It’s all so cyclical, everything is planned. Because a craft activity of that village is so important for its nourishment that if it is not sustained, the next generation will lose touch with their roots. Now, thankfully, they’re looking back at the creativity of, say, the Khatris. There is a demand by fashionable people for their products and that is giving them renewed confidence. SS: We never address the community while we talk about designers and craftsmen. If it hadn’t been for the community, the craft wouldn’t have been there. It is a cohesive effort and everyone’s interdependent on one another. Bandhni is done by women basically because you need small hands to tie the cloth. Women work on kantha…they prepare the warp, the weft, they’re dyeing for you, but they don’t get the credibility. SK: Fortunately, we have stayed true to what we started at Melange. There were many heartaches. We watched as georgette-embroidered sarees made their way into the wardrobes of the most beautiful women who otherwise bought natural fabrics. But I am glad it is cyclic and everything changes. So we haven’t changed the aesthetics at Melange, we have stayed true. We haven’t compromised. We carry clothes like what you saw on the ramp at our show because we attract only a specific kind of people to the store. The process is to grow and see how the patterns are changing, how Zara-fication is happening, but it does not mean I’m critical of it. That’s how it is. That’s fast fashion and we are slow fashion. SS: You know, Sangita, I also feel that when we’re doing coordinates, anyone can buy that high-street label and combine that with our logo. So that versatility has come about. That’s what my collection is about. SK: I could buy a little jacket from her collection and just wear it with a T-shirt and pair of jeans and it’d look as smart. It has a silhouette which is global. So even though the traditional skill of bandhni has been used on her clothes, she has placed it really well, and that’s what makes it special. SS: And you know, the community is not completely rural, it is the urban community that you work with too, so everybody is involved. The people in our small workshop are also sitting and checking if the fabric is handwoven. There is another set of people that are marking and checking the fabrics and sending it off to the bandhni team. So you see how much of employment you generate with just one jacket. SS: I think you are part of a change that is socially responsible. When you start retailing and giving people orders, the craftsmen are happy and there is a process chain that is kicked off. Everybody has an investment. It is far more satisfying. SK: I feel joyous when my daughter-in-law finds something in my cupboard and thinks it’s beautiful, wants to know where it came from and sees value in something that was handmade two decades ago. It’s a marvellous moment.